The Halifax and Region Military Family Resource Centre (MFRC) has teamed up with The Royal Canadian Legion to open both of their doors, phone lines, websites and in-boxes to a whole new crop of military families. Since 2006, the MFRC has hosted a twice-yearly series of family awareness sessions at Legion branches around the province, reaching out to small communities to raise awareness about the military family services available. 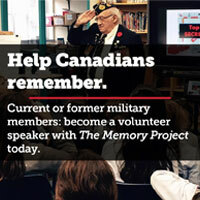 The presentations have focused especially on informing the parents of CF members about the services offered by the MFRC. Mullin-Splude notes that the majority of Halifax’s military population is made up of young reservists, many of whom do not come from military families themselves. Their parents are often unfamiliar with the military lifestyle, and the services available to them. Through the MFRC’s outreach sessions, these families receive information on remote and community services, and have the opportunity to ask questions and interact with one another in a relaxed, comfortable atmosphere. She notes that the MFRC’s partnership with the Legion has proven beneficial for the Legion’s own outreach programs by getting military families in the door. Bernie has also made an effort to give back to the Legion by delivering presentations at local branches on how to best reach out to the new generation of young soldiers, veterans and their families. Since the outreach partnership began, the MFRC has made dozens of visits in small rural communities, all with the Legion’s support. The sessions have grown in scope to include more deployment-support presentations, with guest speakers from the Legion, the Operational Stress Injury Support Services and Casualty Support Services. The MFRC team plans to continue going on the road every spring and fall. Note: Provincial command service officers from Newfoundland and Labrador to British Columbia / Yukon are engaging and partnering with MFRCs to ensure the needs of veterans and their families are being met through a variety of collaborative activities. Outreach initiatives into rural as well as urban centres across the country by the grassroots are essential to meet the diverse need of military families.